Malabar Memecylon is a bushy shrub with leaves 5-12 x 1.5-4 cm, ovate, tip gradually pointed, heart-shaped at base, stalkless; nerves obscure. Flowers are borne fascicled in very dense many-flowered cymes; flower-cluster-stalks 1-2 mm long; flower-stalks short, 1-2 mm long. Sepal tube is 1-2 mm long, bell-shaped, flat at tip. 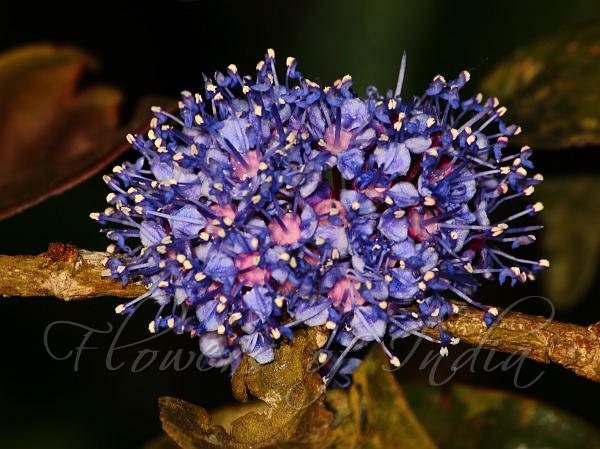 Petals are 1-2 mm long, obovate, blue. Style subulate, about 3 mm long. Berry 4-5 mm across, spherical. 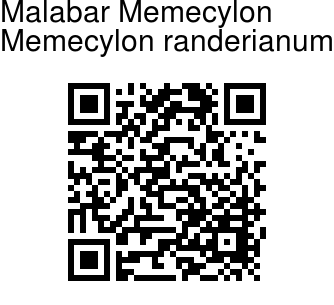 Malabar Memecylon is endemic to Southern Western Ghats. Flowering: February-May. Identification credit: S. Jeevith Photographed in Shola forest, The Nilgiris, Tamil Nadu.